The wedding reception is a very important moment both for the newlyweds and for their families. It gives them a chance to get to know their new relatives - and the first impressions can be crucial! Planning the celebration we traditionally put great effort into choosing the facility, decorations, food and music. But in addition to the party’s smooth functioning, you ought to think of some get-to-know activities. One of them is to make a photo video montage for wedding and watch it together. This is a great way to introduce both the bride and the groom and share their life and love story with the new family and friends. 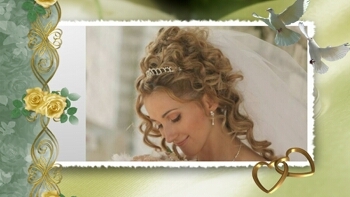 There are many companies where you can order a professional photo video montage for wedding. However, it goes without saying that a presentation of this kind is a lot more personal and touching if it was prepared by a family member or a close friend. No special skills are necessary to do it yourself. All you need is a collection of photographs and a smart computer program, such as Photo Slideshow Creator. With its intuitive interface and infinite design features, you can easily make a fascinating personalized photo video montage that will become the highlight of the event. If you are ready to have a try with photo slideshow software, here are some useful tips and ideas. Montage is a popular technique in photo design as well as filmmaking. A photo video montage is composed of photographs or other images arranged together in a sequence that suggests the passage of time. It’s a great way to show the audience the bride and groom’s life stories, from early childhood to their first date. Watching them grow up, meet each other and fall in love on the screen will touch the hearts of everyone present. Photo Slideshow Creator provides you with an amazing collection of beautiful themes. The photographs framed by stylish decorative elements will look even more impressive. Besides, you can insert some phrases into the picture slides or between them. These can be personal reminiscences, love quotes, or words of wisdom. It’s hard to imagine a photo video montage for wedding without a romantic music soundtrack. Since the software enables you to use several songs in your project, it’s great if you include the bride and groom’s favorite songs along with some melody that is very special for both of them. It may remind them of the day they met, their first date or first dance. When your project is ready, transfer the completed photo video montage to DVD. In Burn Photos to DVD you can read a step-by-step guide to doing that. It is very easy to make any number of copies – be prepared that the guests will want to have them! Try Photo Slideshow Creator to help you prepare a heartfelt and unforgettable wedding party!